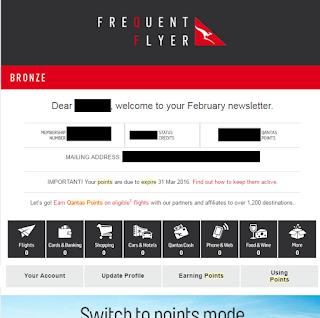 Perth Hacks - best tips, hints and bargains: What to do when your Qantas / Virgin points expire? What to do when your Qantas / Virgin points expire? Yep.. we warned you. Where? There.. just below the mailing address and just before the other large advertisement graphics and the points earned. There is the warning. Would you have missed it? Anyway, they called up Qantas and after a lengthy conversation with various people, the person was issued with a points challenge. Earn 2500 points from two separate sources (eg credit card, woolworths rewards, qantas flight etc) within six months and the points will be credited back. We're not sure whether a similar "challenge" is offered by other airlines (so please leave a comment if you know). The good news is that the person did complete the points challenge and the points were automatically credited back. The bad news is that there are probably a lot of people out there secretly hating Qantas for robbing them of their hard earned points - with no idea that they could have had the points reinstated by a points challenge. Do you know someone who may lose their points or has already lost their points? Maybe pass this post on to those around you unless you fall in the camp of those waving their fists saying "serves them right".